This work was painted at a very important moment in Rico’s career, a period spent in direct contact with Fortuny in Granada in 1871 and 1872. He move there towards the end of 1870, but he was already familiar with that city from a stay in 1857 while painting in Sierra Nevada. On November 18 of that year, Fortuny wrote a letter inviting Rico to join him and his brother-in-law, Ricardo de Madrazo. As Rico recalls, the three artists worked separately, each painting outdoors. They were lodged in four adjoining rooms at the Fonda de los Siete Suelos in the Alhambra’s poplar grove, where they often painted. Thus, different aspects of Granada naturally became the subject of oils and watercolors in which Rico developed a new sense of light that closely resembles Fortuny’s. As a specialist in landscape, he knew the locations very well and had carefully weighed the merits of the city’s different views. 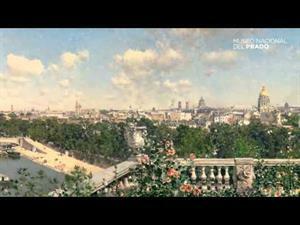 So, when his friend, Alsatian painter Jules Worms, arrived for a six-week stay, he immediately provided him with a list of places he should visit and paint. 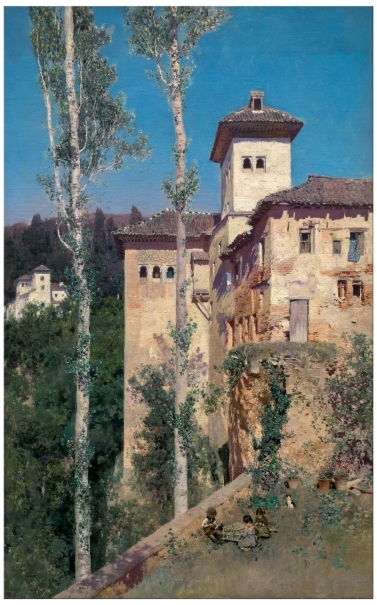 The Alhambra was on that list, but seen from outside, as that allowed him to capture the harmonious relation of its architecture with the surrounding vegetation. Here, he focused on the ancient tower of Las Damas, which is near the early 14th-century Partal (portico) in the Alhambra’s outer wall. In the first third of the 19th century, this building ceased being a part of the royal heritage after a private owner purchased it very inexpensively and made it his home. Rico prepared this work with various pencil studies of the buildings’ main lines that reveal his characteristic agility. In the final work, he moved the viewpoint to the north in order to represent the façades of the buildings alongside the tower. He also lowered the viewpoint, so that the architecture appears in its wooded setting, with vegetation that even climbs the walls. The two tall, green-leafed poplar trees are cut off by the upper edge of the canvas, increasing their slender appearance. They thus serve as a sort of portico or prelude to the buildings’ considerable elegance, which is, in turn, echoed by the Generalife in the background. The composition is subtly enlivened by small figures of three children around a large cage, and a cat. Various similar studies by Rico from that period reveal his interest in this motif, and other works he painted in Granada also show children playing in front of buildings. Moreover, some of Fortuny’s paintings also show children whose scale with relation to the overall composition is very similar. The refinement with which Rico renders the different qualities of the wall and its distinct texture and relief reveals a spirit similar to Fortuny’s in the search for material qualities. 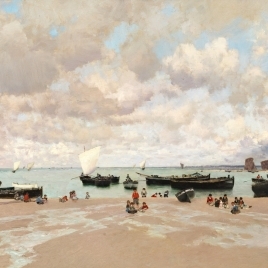 However, the serene composition, smooth atmosphere and cool colors are characteristic of landscapes from this period in Rico’s career and they were praised by critics at the Universal Exposition of 1878 as the finest, earning him a third-class medal there. Landscapes like the present one transmit a sense of tranquility not found in Fortuny’s paintings. 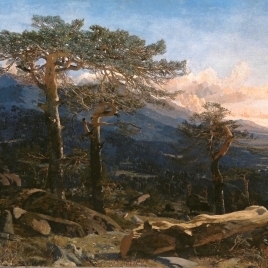 The balanced composition and the presentation of the light as if it were suspended in time bring a certain feeling of peaceful duration to this landscape painted directly from nature at a specific hour (Text drawn from Barón, J.: El siglo XIX en el Prado, Museo Nacional del Prado, 2007, pp. 318-321). Height: 63.5 cm. ; Width: 40 cm. Legacy of Ramón de Errazu y Rubio de Tejada, 1904. Exposition Universelle, Les chefs-d'oeuvre d'art a l'Exposition Universelle, 1878, [s.n., Paris, 1878, pp. 121. Ossorio y Bernard, Manuel, Galería biográfica de artistas españoles del Siglo XIX, [s.n. ], Madrid, 1883, pp. 578. Madrazo, Pedro de (1816-1898), Catálogo de los cuadros del Museo del Prado /, Imprenta y fototipia de J. Lacoste, Madrid, 1910, pp. 431. Museo Nacional del Prado, Museo del Prado: catálogo, Museo del Prado, Madrid, 1933, pp. 676. Granada. La Ciudad y Su Paisaje, Fundacion Rodriguez Acosta, Granada, 1962, pp. n.59. Museo Nacional del Prado, Museo del Prado: catálogo de las pinturas, Museo del Prado, Madrid, 1972, pp. 558. Puente, J. de la, Pintura Espanhola Do Seculo XIX, Fundacion Gulbenkian, Lisboa, 1974, pp. n.58. Museo Nacional del Prado, Catálogo de las pinturas del siglo XIX, Ministerio de Cultura, Madrid, 1985, pp. 219. Puente, Joaquín de la, Pintura Española del Siglo XIX. Catalogo, [s.n], 1987, pp. s.n. Menéndez Pidal, Ramón, Historia de España, 35, Espasa-Calpe, Madrid, 1989, pp. 402, n. 168. Czymmek, Götz, Landschaft Im Licht. Impressionische Malerei in Europa Und N, WallrafRichartzMuseum Köln, Köln, 1990, pp. n.153. Díez, José Luis, Da Goya a Picasso. La Pittura Spagnola Dell'Ottocento, Mazzotta, Milano, 1991, pp. 172 n.47. Museo Nacional del Prado, Pintura española del siglo XIX: del neoclasicismo al moderni, Ministerio de Cultura, Dirección General de Cooper, Madrid, 1992, pp. 150, n.35. De Fortuny a Picasso. 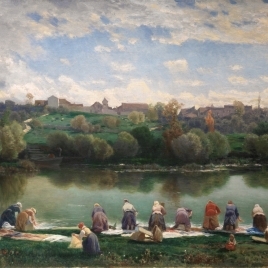 Trente Ans de Peinture Espagnole 1874-, Musèe des BeauxArts, Agen, 1994, pp. 33. Museo Nacional del Prado, Museo del Prado. Inventario general de pinturas. Nuevas Adquisiciones. Museo Iconográfico. Tapices., Museo del Prado, Espasa Calpe, Madrid, 1996, pp. 358 n. 1375. El legado de Ramón de Errazu: Fortuny, Madrazo y Rico, Museo Nacional del Prado, Madrid, 2005, pp. 90-93 n.3. Díez, José Luis; Barón, Javier (ed. ), El siglo XIX en el Prado, Museo Nacional del Prado, Madrid, 2007, pp. 318-321 n.71. Barón, Javier, El paisajista Martín Rico (1833-1908), Museo Nacional del Prado, Madrid, 2012, pp. 165-167 n.23. 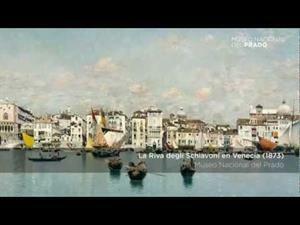 Barón, Javier, Impressions of Europe. Nineteenth-Century Vistas by Martín Rico, Meadows Museum, Southern Methodist University. Museo Nacional del Prado, Madrid, 2013, pp. 167-169 n.22. Tiempo de ensoñación: Andalucía en el imaginario de Fortuny, Fundación Bancaria "la Caixa": Patronato de la Alhambra, 2016, pp. 183 f.167. Gutiérrez Márquez, Ana, Cecilia de Madrazo: Luz y memoria de Mariano Fortuny., Museo Nacional del Prado. Fundación María Cristina Masaveu, Madrid, 2017, pp. 50. Inv. Nuevas Adquisiciones (iniciado en 1856). Núm. 1375. 1375 / Autor = Martin Rico y Ortega / Asunto = Torre de las Damas en la Alhambra / de Granada (lienzo) / Dimensiones = Alto = 0,625 Ancho = 0,39 [Nota en registro superior] Como se ha notado que los cuadros de la colec- / ción legada por D. Ramon de Errazu, no se hallan / inventariados, se ponen ahora en este sitio aun- / que debieran estar antes. [Nota en margen superior izquierdo] Legado de D. / Ramon de / Errazu, que / se aceptó por / Real Orden de / 13 de diciembre / de 1904. Catálogo Museo del Prado, 1942-1996. Núm. 2623. Catálogo Museo del Prado, 1985. Núm. 2623.